The shortlist has been announced for the annual Canada Reads debate. During Canada Reads, five personalities champion five different books, each champion extolling the merits of one of the titles. The debate is broadcast over a series of five programs. At the end of each episode, the panelists vote one title out of the competition until only one book remains. This book is then billed as “the book that all of Canada should read.” The theme for this year is “One Book to Move You,” and the debates take place March 25-28, 2019. The publisher of the winning Canada Reads title donates a portion of sales proceeds from the winning book to a charitable organization working in the field of literacy. 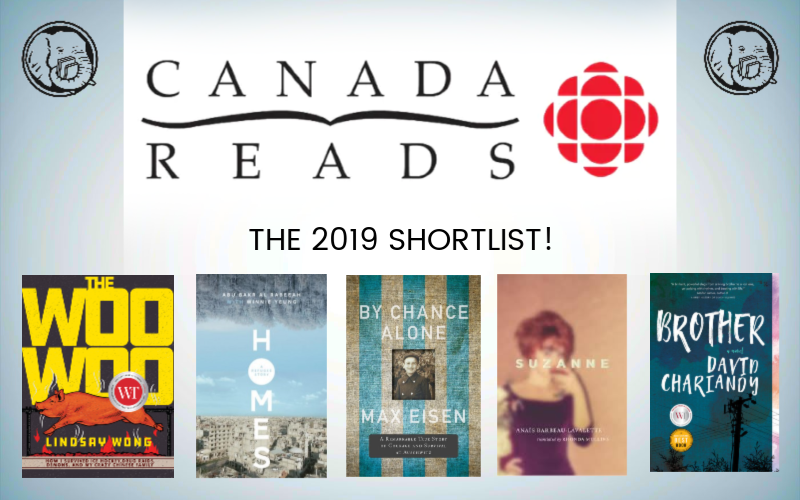 The shortlist for 2019 includes Homes by Abu Bakr al Rabeeah with Winnie Yeung, Brother by David Chariandy, By Chance Alone by Max Eisen, Suzanne by Anais Barbeau-Lavalette and The Woo-Woo by Lindsay Wong.